Some words come with opposites. Up vs Down. Black vs White. Day vs Night. Hot vs Cold. Asleep vs Awake. But that last pair is perhaps the most interesting. Are we really either asleep or awake, conscious or unconscious? Not really. Like “hot and cold”, we can move smoothly from one state to the other. Fully asleep – half-asleep – half-awake – fully awake. And even when we’re fully awake, there are times when we feel more alert or more alive than others. We can be filled with joy, overflowing with happiness. Consciousness is like light or music: it can vary in brightness and colour, in volume and emotion. In fact, that’s why we use art and music: to change our consciousness by changing what’s in our minds. That’s also why we use drugs like alcohol. A drink can relax us, make us enjoy ourselves more. But alcohol blunts consciousness rather than sharpens it. Some drugs do the opposite. And some drugs, like LSD and magic mushrooms, seem to create new forms of consciousness and even allow people to reach different levels of existence. Are they evidence for an afterlife, for survival after death and the existence of a spirit that isn’t dependant on our material body? Perhaps, but there’s another possibility. Our ideas about an afterlife may originally come from the experiences of early humans with natural drugs. Many traditional religions have mind-altering plants at the centre of their rituals and beliefs. The shamans of Europe often ate a mushroom called the Fly Agaric. 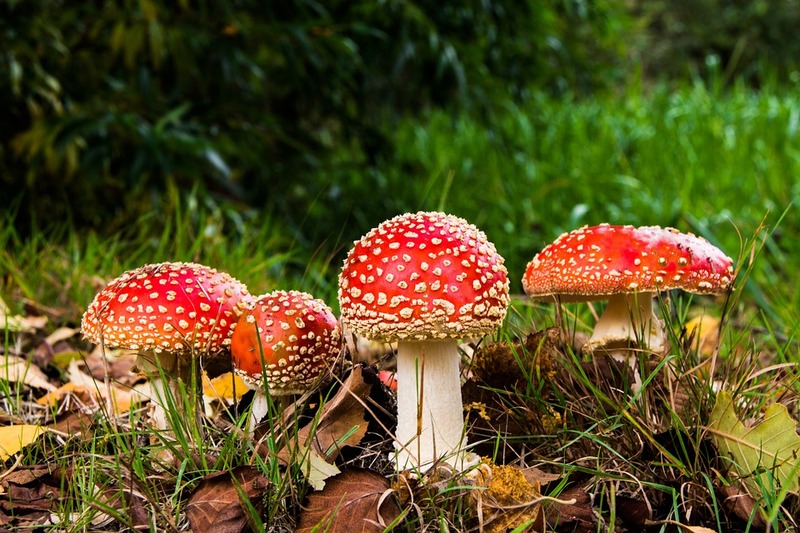 It has a red cap with white spots and and you can see it drawn in books of fairy-stories as the classic “Witch’s Toadstool”. It takes its common name in English from the way it was sometimes broken into pieces and placed in a saucer of milk to kill flies. Chemicals in the mushroom would soak into the milk and when flies drank the milk, they would die or become sluggish and easy to swat. And the Fly Agaric certainly looks poisonous. Many people today think it’s deadly and it would certainly be unwise to eat one. But that’s because it would make you feel drunk and start hallucinating, not because it would kill you. The shamans and others who ate them as part of the ancient folk-religions of Europe felt as though they were flying, leaving the earth and travelling to the world of the spirits. So you can say that mushrooms were mystical. In South America, other species of mushroom were eaten in a similar way: to place priests and worshippers in touch with the world of spirits and the gods. In Mexico, there’s a cactus that can have powerful effects on the mind. That’s where a drug called mescaline come from. Many people have taken mescaline down the centuries, but one of the most famous was the writer Aldous Huxley (1894-1963). He was very interested in religion and altered states of consciousness. After taking mescaline in 1953, he wrote a book about his experiences called The Doors of Perception. That’s where the Doors, with their lead-singer Jim Morrison, got their name from. Huxley described how mescaline altered his experience of time and made even the most ordinary things seem endlessly rich and fascinating. A chair was like a cathedral. A flower was like a living jewel. A crack in a wall was like a highway to heaven. Huxley’s theory was that mescaline opened filters in the brain that usually restrict the flow of information from the outside world. In ordinary life, we want to see what’s important to our survival, but that’s only a small part of what is out there. Our “doors of perception” are only open a chink. Mescaline flings the doors of perception wide and the true beauty and richness of the world floods into our brains. That’s what Huxley thought, at least. And he made another experiment with mescaline: he took it when he was dying. Did he see the afterlife waiting for him? Or did the mescaline take him out of time, so that he experienced eternity in his final moments?